ONE of the websites I follow is that of journalist, new media strategist and now interactive map guru Simon Dickson. 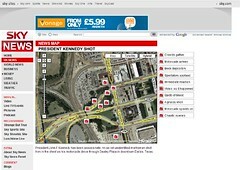 He has announced the launch of a Google map style tool for news websites that can draw on text, photographs and video from a key event. Once live it will allow readers to click backwards and forwards through a story in a timeline format, a really imaginative way to tell a story. I'm sure he has already got something similar in the pipeline, but imagine this hooked into Google Earth that uses the GPS built into mobile phone cameras to place you where the person themselves stood as you watch their video clip, so you can look all around you. And then move onto the next location and the next... a bit like Google Maps Street View. ONE of the key elements of the internet today is the ability for website publishers to provide a simple way for interested readers to stay in touch with their new "stuff". Whatever you produce be it words, artwork, music, video or actual items to buy if you don't have your site updates linked into RSS feeds you are missing out on where the internet is going. I have written about it before where I was highlighting how to grow a community, but things have changed and whereas I wrote in that piece that you could use these tools to allow people to link up on your own site, that is not the only place to look nowadays. 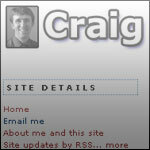 Through RSS feeds people can place small buttons to display your new "stuff" wherever they want to; on their own sites, in their email signatures or on their social networking pages. And as Jeff Jarvis writes today, looking further into the future and beyond the days of the home page, you could be keeping interested readers in touch with your work whenever they choose. This is how not to use read receipts and similar in email unless you are happy to never see your client featured in a publication ever again. As my pal used to say "rocket science is quite simple really", so are these tips from Linda. How one PR practitioner works with clients to both ensure they receive a good deal and enjoy strong coverage in the press. What to do when the Mail on Sunday comes looking for blood. Maybe the PR bods highlighted by Rob above should take five minutes to read over this view of public relations in this new connected online world. ARE you watching more online video, be it music, news or even mini-series? I have found myself doing so. But the common theme very often is that I am not seeing things on YouTube or similar first, but on other sites who embed clips or link across to interesting finds. I am currently hanging around my RSS reader almost every day waiting for the next instalment from the ichannel, a great Kafkaesque tale for the internet world that I found via NewTeeVee. THE recent passing by the NUJ of a resolution that called for a boycott of Israeli goods caused a great deal of disappointment amongst many members, and anger from others. Having been successful in mandating the Manchester NUJ branch delegates to vote against the anti-Israel resolution at Annual Conference, members of the branch have now succeeded in having a resolution passed at branch level to seek a way to prevent the resolution being put into effect. 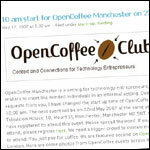 JUST a quick pointer to the OpenCoffee Club meeting taking place in Manchester city centre tomorrow morning (May 22), see 10 am start for OpenCoffee Manchester. I can't make it myself but it could prove useful to drop in on if you have ideas and thoughts from a tech or online perspective - it'll only cost you a coffee. I attended the first meeting of a number of digital editors from a variety of backgrounds that aims to share knowledge and information. Personally I think established media groups can learn much from online communities and blogging networks, and I'm sure in return the editorial skills many media groups possess would prove invaluable to many. Commissioning editors - what do they want? The Wordsmith offers some very valuable advice on what a commissioning editor wants, especially one who oversees a smaller publication and is tight on resources. Julia tells the real life story of her grandmother and her experiences of Russian life during the Second World War - start at the bottom of the page and work your way up. I admit I have an interest in this site being Sky Blue through and through. But I also wanted to show the depth and range of articles Andrew Keenan produces for his site. AN important new addition to the TypePad service has been announced that allows you to create stand alone pages, for example offering contact details. In the past the only way to do this without using Advanced Templates was to create a page and back date it so it didn't appear on the front page and make any updates when required. But as TypePad explains it is now a simple option of writing a "New Page" instead of post, giving it a file name and then linking to it from a sidebar.